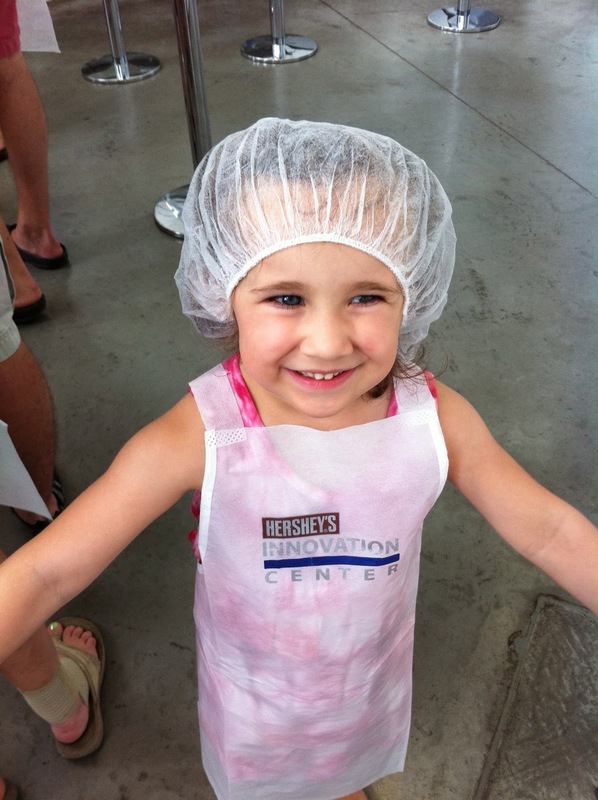 Home » Uncategorized » Hershey Pennsylvania…. bring the big bucks with you! Our family went to Hershey PA this past weekend, yes, we chose the hottest weekend of the summer so far, but overall we had a great time. I am here to warn you though, bring along the big bucks if you plan to visit. So we were lucky enough to get tickets from Chevrolet for 4 admissions. Tickets to enter HersheyPark are $53.95 per adult. WOW, this is close to Disney prices for the day. 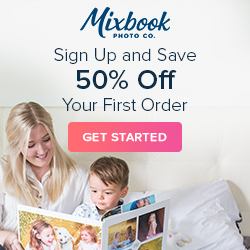 The most important tip I can tell you is to take advantage of the Preview Plan. If you buy a regular price admission you can get FREE admission to the whole park the night before for 2.5 hours before it closes. This worked out really great for us. On Friday night my husband took the 3 oldest kids to the park from 7:30-10 and it was EMPTY! Literally they rode all the rides 5 times in a row, they did not even need to get up and get in line again. They said this was the most fun night of their lives!!!! One more tip, bring along lots of extra clothing. They came back from the park soaking wet every single visit. The preview night is awesome, try and do it if you can. We stayed at an awesome hotel, the Hilton Garden Inn in Hummelstown. It is about a 5 minute drive, located near many good and reasonable restaurants, and was a clean, comfortable place to sleep. We used our HHonors points to stay here and got 2 rooms for 2 nights. If we did not have points to stay here it would have been about $230 a night. Breakfast was included for us, but I think it was still worth the $10.95 per person. Made to order eggs, pancakes, omelets, waffles, fruits, cereals, breads, pastries. 3 kinds of cold beverages, many hot beverages. All the usual breakfast foods were easily found here. 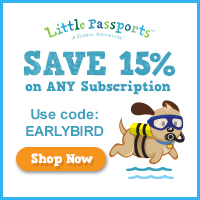 Lisa greeted us each morning with lots of great tips and helpful hints for us! So HersheyPark is right next to Hershey’s Chocolate World. One thing I did not understand was why Chocolate World was always so CROWDED! Literally impossible to walk around at times. Day, night, afternoon, always a mob scene. There is a very cute ride which shows you how Hershey makes chocolate. This ride lasts about 5 minutes and is free. 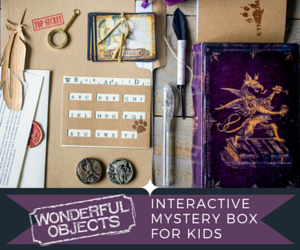 Enjoy this freebie, because it is the last one I can tell you about. My 2 younger kids did not go to Hershey Park. 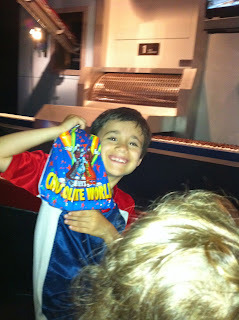 Instead we hung out at the hotel, played games, and spent some time at Hershey’s Chocolate World. 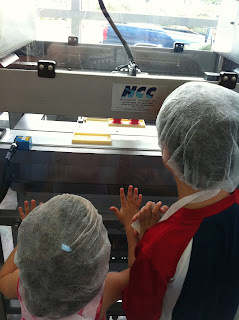 The big things they both wanted to do was make their own chocolate bar. This would have been really fun and so cool if we actually were going to make our own bar. Nope, we did not make anything. 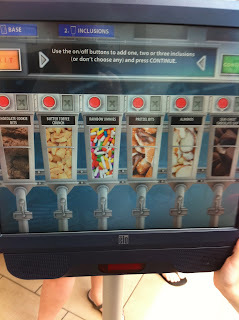 All we did was scan our $14.95 ticket 5 times and choose what items we wanted the robot arms to put into our candy bar. But the biggest scam of them all is that you cannot accompany your child into the chocolate making without paying to make a chocolate bar for yourself too!!! And if you have a 2.5 year old, yup, she has to pay and make one too. So for the four of us, including my little girl and myself, who did not want to make a bar we paid $60 for a 45 minute “tour” of the chocolate bar. Total ripoff! 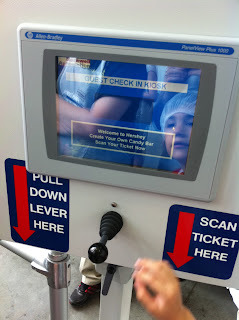 As soon as you walk into chocolate world you can choose to buy a ticket to your left or your right. 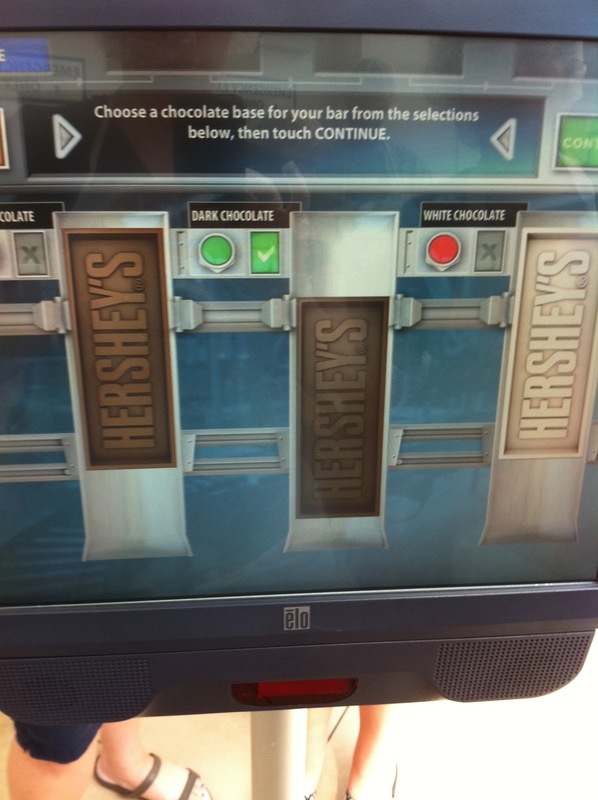 On the left you can buy a ticket to the Hershey 3D show. We did not see it, but if you want to it will be 5.95 per adult and 4.95 per kid. On the left side you can also buy a ticket for the hershey trolley at 12.95 per adult and 5.95 per kid. Every time we saw a trolley go by, it was full, so get those tickets early! On the right side you can buy your 14.95 make your own chocolate bar experience ticket and also a chocolate tasting tour, 9.95 adult and 6.95 per kid. We did not do this either. We just did the chocolate bar making. So you are given a time for making your bar and you greet a Hershey worker wearing a hard hat who gives you an apron that you must put on right away. 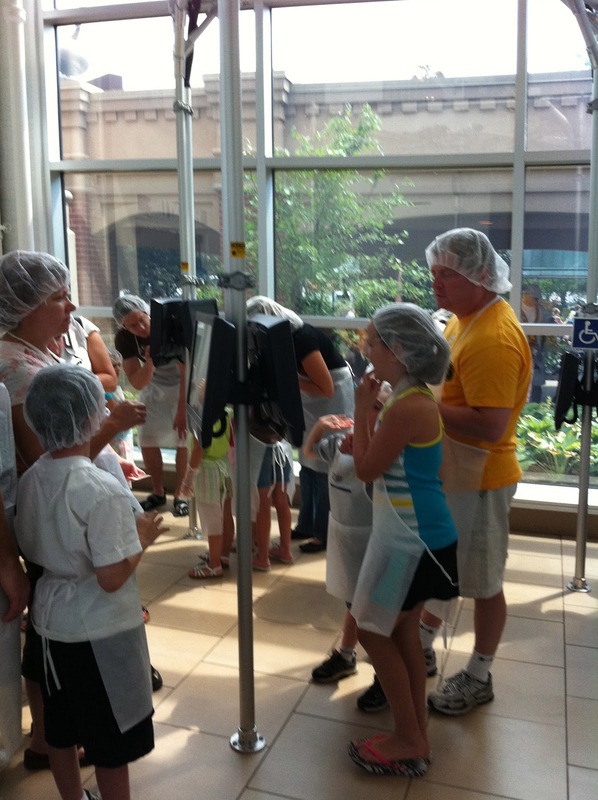 You enter the doors with your group and then you are immediately handed your hairnet. The factory worker kept us back because my little girl had teeny pieces of hair sticking out, she made us all put our ears and all our hair under the hairnet and wasted lots of time doing this. And for what?? We did not touch anything, nor were we near anything. But wait, we are not done making you look ridiculous Mom. You are wearing a ring on each hand so now you must put on these uncomfortable and sweaty gloves to keep the chocolate out of your rings. I was excited at the time, thinking I would be making my own chocolates, but no, this was all just for show. Now that we are covered up head to toe, we watched a short movie showing us how they make the chocolate. Then we entered our first room of touch screen computers. Each of us had a ticket with our name on it and we each had to scan it then choose our components. 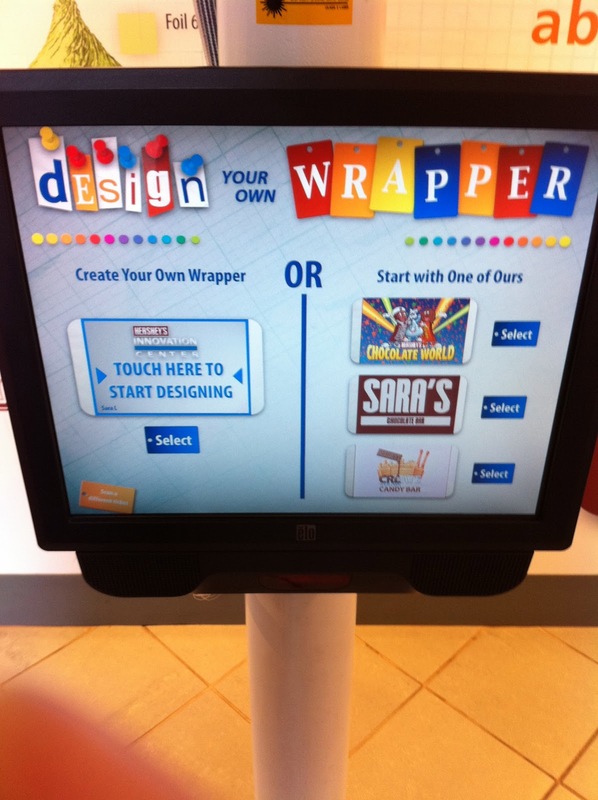 After choosing the items on 4 screens, there you go, you just made your chocolate bar. Now you can stand back and watch the machines do all the work. The first screen option was for the base of your chocolate bar. Today we chose from milk, dark and white. You also need to know that if you chose dark or white chocolate base, you will still have a milk chocolate top because that is all that the machine can do. Second screen is to choose UP to 3 choices for inclusions. These inclusions will be sprinkled into your bar base by the machines. Some bars get a lot of each inclusion, others get 2 or 3 pieces. 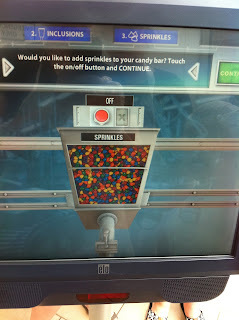 And for your final option, do you want the machine to sprinkle colored sprinkles on the top of your bar? 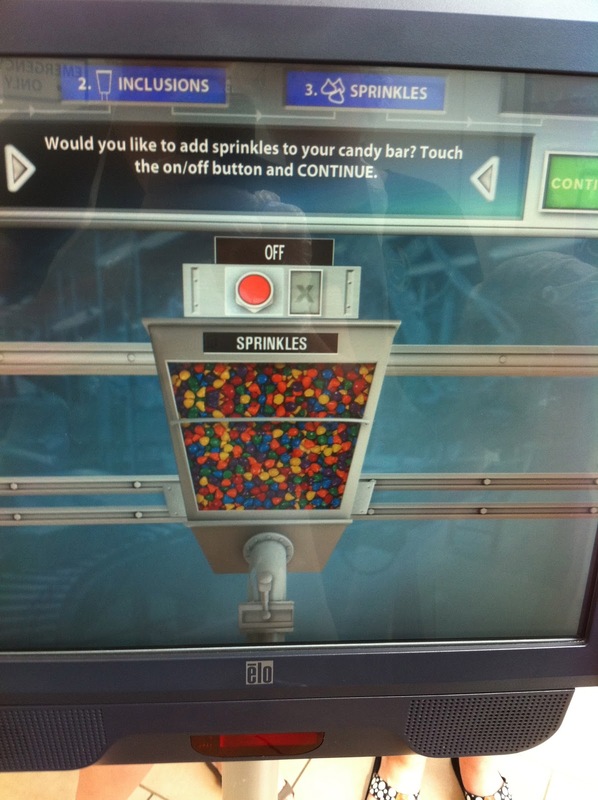 yes, or no, and if you choose yes, you will get about 10 sprinkles on top. If you say no, you still might get a few, this is a machine after all. So now the excitement is over and you walk into the “factory” and scan your ticket again and watch your magical bar being made. 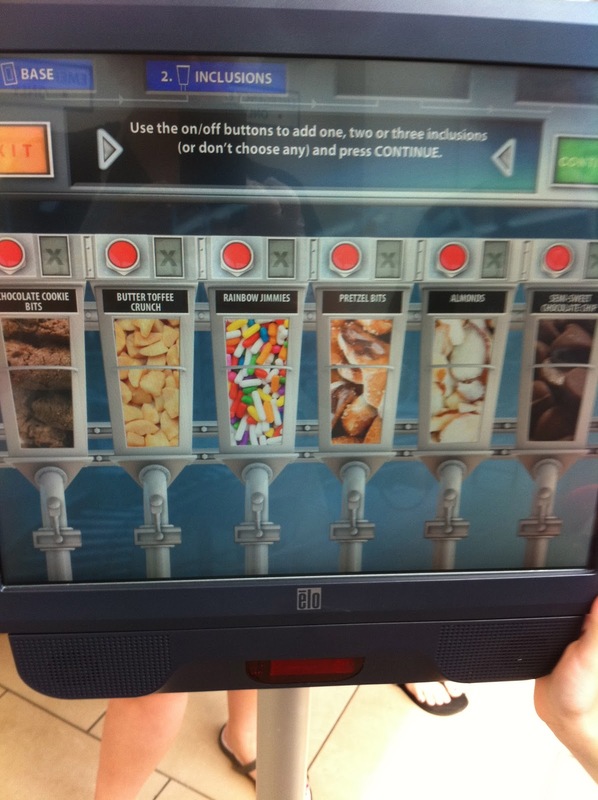 As the machine works on your bar it says each person’s name under their bar, just in case you can’t keep up. 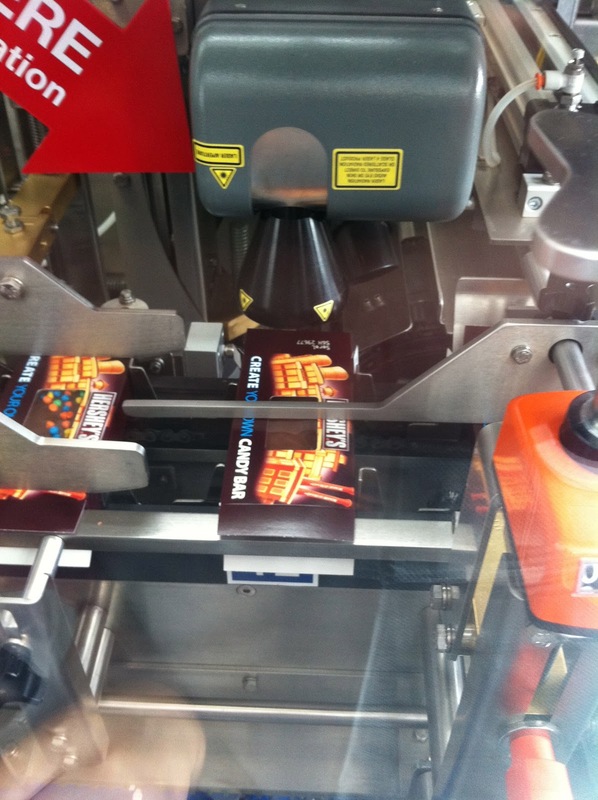 Here is one of our bars getting one of the inclusions sprinkled in. Exciting no? 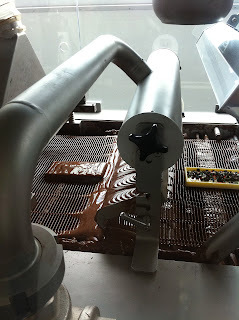 Each bar goes through the chocolate bath and gets coated with the milk chocolate topping. 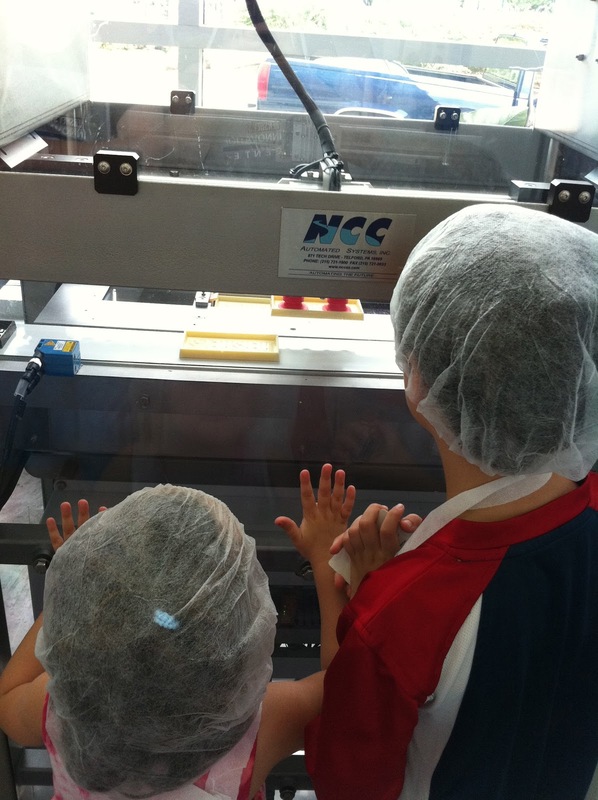 The kids did love watching this step, but with so many people in the room, you get pushed along and cannot sit there watching the chocolate for very long. 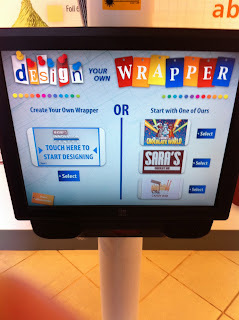 So your bar is done, now you can design your own wrapper. There are a few choices. 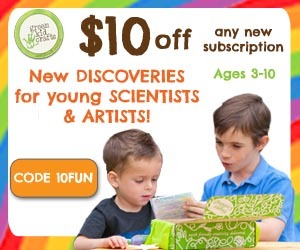 You can use their samples or be a bit more creative and design your own. Even if you try to get creative, there are limits to your options and you are not really making an original design, you are choosing from their available clip-art pictures. 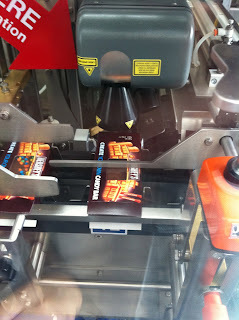 So while you are wasting time in the package design room, your chocolate bar is in the cooler tunnel. 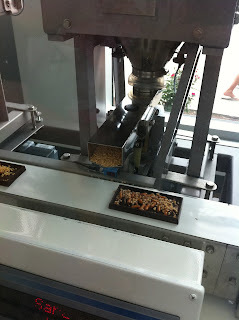 It spends about 5 minutes in there, hardening up so you can have a bar that does not melt immediately. This cool laser writes your name on the box and then puts the bar in the box as well. Kind of cool to watch the laser working. So there you have it. 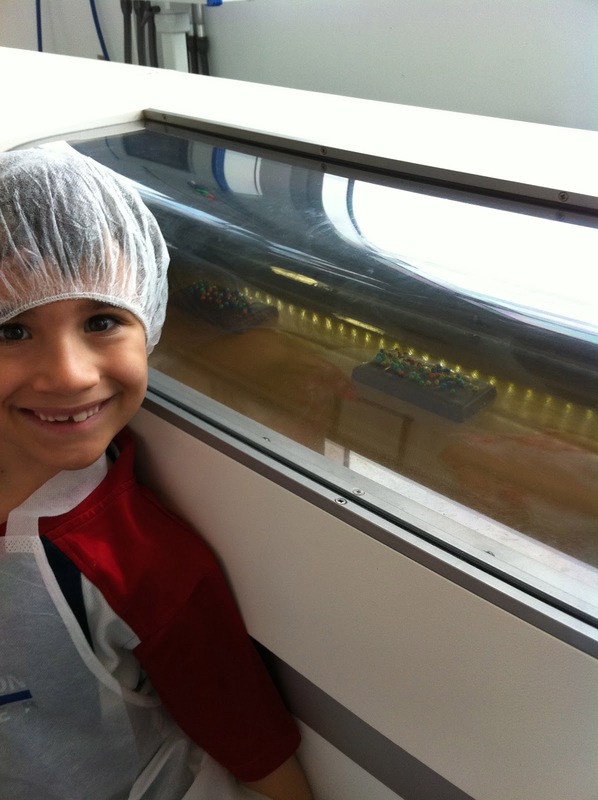 And here is a very happy 7 year old, thrilled to have made his own bar. He loved every second of it and I enjoyed watching him. Any questions, leave me a comment and I will respond asap. Thanks for all the great information. I keep thinking about heading to Hershey Park. Now I know I need to be prepared to spend LOTS of $$. Thanks for your comment Kelly. I was really shocked to see how expensive Hershey was. At Disney I expect the sticker shock, I just did not think Hershey would be along the same lines! Sound like a lot of fun, but I wouldn't have expected it to be that expensive. Wowzers!